by MERKS: Day 136, outfit 136. Today, I'm wearing a vintage green leather jacket. Bought it in Rotterdam at Cheap Fashion. Combined with all black. 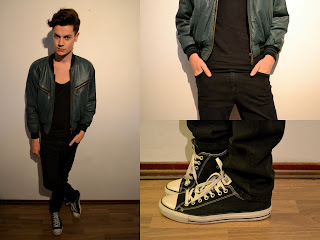 Just a basic black skinny jeans, a black t-shirt and my black Converse All Star Low. BTW, I GOT A NEW HAIRCUT!